15" overall. 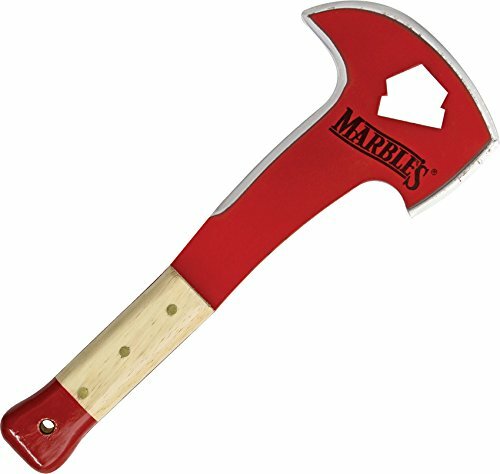 8 3/4" Red finish carbon steel Axe head with 3" cutting edge. Majority of head is also sharpened. Cutout opens fire hydrants and oxygen tanks. Natural wood handle with Red painted trim. Lanyard hole. Axe head will show rust. View More In Axes & Hatchets. If you have any questions about this product by Marbles, contact us by completing and submitting the form below. If you are looking for a specif part number, please include it with your message. SURVIVAL TOMAHAWK TACTICAL THROWING AXE w/SHEATH Hatchet Knife Hawk/9"